OC Mom Activities: Shamrock Shakes! 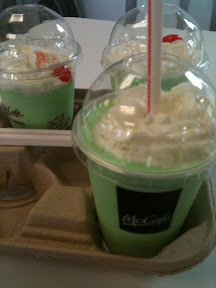 It's a March tradition in our house to get the Shamrock shakes. After I picked up the boys from school, we headed straight to our closest McDonald's to grab them. After several minutes of shear panic on the part of the employees, they fixed the glitch and were able to serve the massive crowd of green that had arrived for Shamrock shakes.